The SQL Server Sequence has concluded. Congratulations to our Grand Prize Winner, Nikolas Allen! In anticipation of the SQL Server R2 launch, we held a contest to test your knowledge of SQL Server and give away some great prizes in the process. For 12 weeks, we issued a new question per week on one of our three social networks: Facebook, Twitter, and YouTube. Correct answers earned participants a place in a drawing to win a brand new netbook. (Contestants could find help on the SQL Server website.) The grand prize includes a wireless keyboard and mouse, 24-inch HD monitor, speakers and noise canceling headphones all valued at over $1000. Visit the SQL Server blog for the answers to each week’s question, as well as updates on winners and prizes. Thanks to everyone who participated in the SQL Server Sequence! We’d love to know what you thought of our quiz adventure around our social networks. Leave us your thoughts in the comment section below this post. Be sure to visit the SQL Server website to download SQL Server 2008 R2 CTP and find out more about the upcoming release. 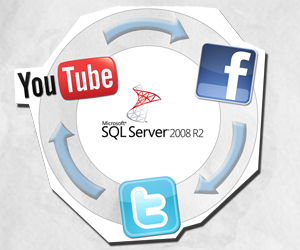 You can also drop by the Facebook page and let us know your experience with SQL Server. Question # 1: What are the four new types of data visualization provided in SQL Server Reporting Services 2008 R2 ? Question # 2: What types of data does Microsoft’s codename “Dallas” allow users to access and combine with their own data for rich reporting and analysis? Answer # 2: Structured, blob, and real-time data. Question # 3: When using PowerPivot for Excel, what is the new language used for authoring formulas or expressions? Question # 4: What type of Unicode compression does SQL Server 2008 R2 support? Question # 5: What tool can administrators use to easily throttle resources on data tier applications? Question # 6: Name the updated SQL Server 2008 R2 enhancement that allows SharePoint customers to store their data remotely and more cost effectively. Answer # 6: Remote blob storage. Question # 7: The current version supports nine algorithms, but how many did the version of Data mining support? Question # 8: Parallel Data Warehouse is build on the old DATAllegro V3 Data Warehouse. What is the size of the largest Data Warehouse supported by DATAllegro? Answer # 8: A whopping 450 terabytes! Question # 9: What date was the PHP Driver for SQL Server created? Question # 10: Name the new Reporting Services 2008 R2 feature that allows you to create a professional-looking report in 5 clicks or less? Question # 11: How many logical processors are supported with SQL Server 2008 R2, running on Windows server 2008 R2? Question # 12: When using the OpenXML format, what is the name of the embedded PowerPivot data file stored in an Excel workbook? Stay tuned for more promotions and be sure to check out the official rules.